In 2006, Offstage Theatre presented their first production, Home. Directed by Cressida Brown and written based on interviews with residents, the piece documented the life of a family on the Beaumont Estate in Leyton, shortly before the high rise flats were demolished and the majority of their inhabitants rehoused in Essex. 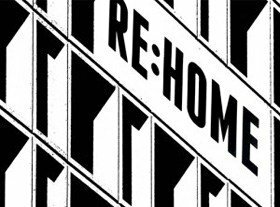 Ten years later, the award-winning Re:Home takes the company back to where it all began, looking back on those stories and placing them alongside new ones. The resulting show is part drama, part documentary, and gives a fascinating insight into not only life on – and off – the estate, but also the complex emotional response of those who were forced to leave their home and community behind. Don’t get me wrong; Re:Home doesn’t set out to paint a falsely idyllic picture of the Beaumont, or the people who lived there. Before the show begins, we’re shown video footage from one of the vacated tower blocks, which is – in the words of more than one of its former residents – pretty nasty. Later, we hear about the people who committed suicide by leaping from the roof, and about the young man stabbed to death on his doorstep, just because he was from the Beaumont. But we also learn that the high rise flats offered one of the best views in London, and that this is a place where everyone knew everyone – some were neighbours for decades. More than once, the point is made that, for better or worse, the Beaumont really isn’t about the buildings, but the people who lived in them; each of the voices that make up Re:Home, in its own way, offers a heartfelt tribute to a lost community. These voices are brought to life by a cast of four actors – Waleed Akhtar, Hasan Dixon, T’Nia Miller and Rose Riley – who slip without a moment’s hesitation in and out of countless different characters, be they male, female, old or young. Moving ceaselessly, they cover every inch of Georgia Lowe’s set, giving the piece a restless and urgent feel throughout. The material included in the show is shared through recordings, video, transcripts, reenactments and drawings (don’t be fooled by the bare set – it’s actually a giant canvas), and though it flips back and forth in time between 2005 and 2015, captions ensure that we always know who’s speaking and from when. Re:Home won the Kevin Spacey Foundation Artists of Choice – UK Theatre Award in 2015, and it’s not hard to see why. The show is a haunting portrait of a time, a place and a community that’s gone forever; many of the interviewees mention ghosts, and you can really feel their presence. Re:Home is at time moving, at others gripping, and often very funny, perfectly capturing the personality and spirit of the people without whom it could never have been made. Offstage Theatre’s website states that the show is ‘giving a voice to a community that no longer exists’. It’s a voice that deserves to be heard. Our homes belong to us. Ten years ago residents of the Beaumont Estate Towers in Leyton looked on as their homes were dismantled brick by brick. Re:Home sequels Cressida Brown’s 2006 production, Home, made and performed before people were moved out of the towers. In 2016, Cressida revisits the Beaumont Estate to make a show about what our homes mean to us today. Using testimonies collected from former and current residents of the estate, Re:Home documents fraying relationships in the changing landscape of East London. Winner of the Kevin Spacey Foundation Artists of Choice, UK Theatre Award, Re:Home is a show brimming with urgency and compassion, giving a voice to a community that no longer exists.